Paper is so 2014. Not to mention the whole "paper cuts" thing. Sign up for Paperless and we'll send you a secure notification whenever there's a new document available for your review. All you need to do is log into your account to see it. You can even print it out if you want. 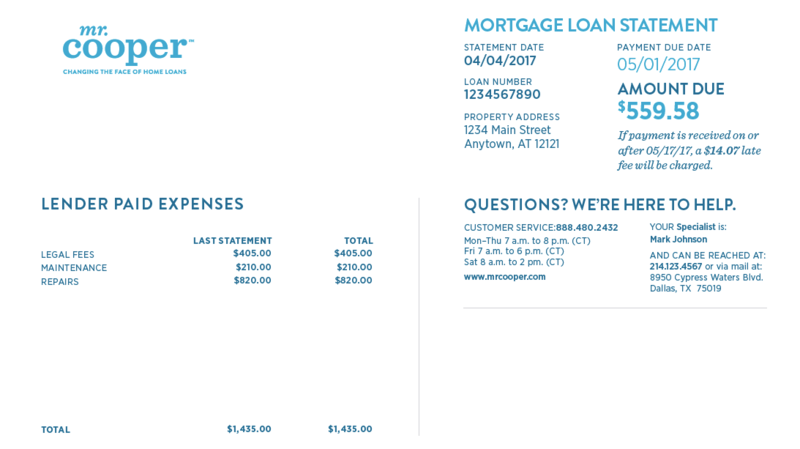 With Paperless, you'll cut down on clutter and you'll never wonder if an important mortgage document was "lost in the mail." You'll also reduce your lovely mail carrier's load by approximately 1.3 ounces at least once a month. We'll send out your monthly statement roughly two weeks before the due date. If for some reason one month it doesn't reach you around the usual date you get it, please check your online statement to find out what you owe and when it's due. We'll say it again: Mortgage statements shouldn't require an advanced degree in finance (plus a minor in statistical analysis) to read. We're constantly listening to your feedback and working to make your statements easier to understand. Here are the basic basics, like the date your statement was generated, loan number, amount due, and your payment due date. 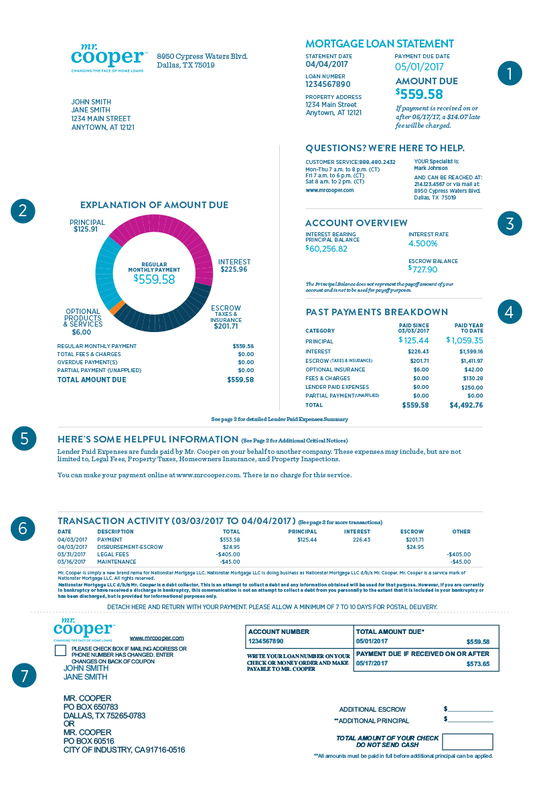 A breakdown of your payment, showing the amount for principal, interest and escrow. If there are optional items, late payments or other fees, they will be shown here as well. Click herefee schedule (PDF) (Opens a new window) to see our complete fee schedule. This will tell you your principal balance, escrow balance, and your current interest rate. This section recaps your last payment and also the payments you've made to date this year. It shows how much went to principal, interest, escrow, optional insurance, and any miscellaneous fees. Here you’ll find important explanations and special notices pertaining to your account, plus useful tips for managing your home loan. A basic recap of your recent transactions on your account and the resulting balances, as well as disbursements we’ve made on your behalf to payees like tax authorities and insurance providers. Want to see more? Sign in to your account. If you pay by mail, please fill out, detach, and return this section with your check or money order. It’s easy. But the easiest and fastest way to pay is online. Sign in to your account to make a one-time payment or set-up AutoPay. It’s free and you never have to lick a stamp. DO YOU HAVE LENDER PAID EXPENSES? If you have any expenses that we paid to maintain and process your home loan, like legal fees, repair costs, or property inspections, then you’ll see these on the second page of your statement. Click here to see an example. If you think you’ve missed a billing statement, here are a few possible explanations. Did you pay on time last month? Missing your payment due date can lead to delays in your next statement. Remember, if you sign up for AutoPay you’ll never have to stress about remembering your payment due date. Please note that you cannot sign up for AutoPay if you have any outstanding late payments or fees on your account. If the postal service returns correspondence we sent you because of an address issue, we stop mailing to you until you update your address. You can verify and update your address here. If you update your mailing address, the change may not take effect until your next billing cycle. This may cause you to miss one statement while the change is processing. All future statements will go to your updated address until you update it again or opt in for Paperless. You can always access your latest statement here. If your loan was recently transferred to Mr. Cooper, your first statement may be slightly delayed. We will send you your first statement within thirty days of your transfer date. Once you've registered for website access, you can see your statement information any time. Also, please remember we do not charge late fees for 60 days from your transfer date. Learn more about the transfer process here. If you are currently in an Active Bankruptcy, we will not generate billing statements for your account for legal reasons. You will also not have online access to your account. We will communicate all important information about your account to your attorney. If you have any questions, please contact our bankruptcy team at 877-343-5602. If you have attorney representation for any other mortgage-related matters, we will send all correspondence to your attorney. To resume sending correspondence to you, we will need written verification you are no longer being represented by an attorney regarding your mortgage. If you have previously opted in to Paperless, we will not mail you statements. Instead, you can securely view, download, and print all your statements from the “Statements” section of your online account. You can check your Paperless status in the “Communication Preferences” tab at the top of your account overview dashboard. If none of these situations apply to you, and you still think you’ve missed a statement in the mail, please contact us and we’ll be glad to help figure it out.